Suddenly Bali. After spending one night at Surabaya, I went to Bali, it was a sudden decision. I planned it H-2 before I got my field break. I usually plan a travel or holiday at least 2 months before my schedule. Since it was my first time, I was really enthusiast. With limited time, I prepared anything that I could prepare. I planed where to go, what to eat, where to eat, what to do, where to eat, what to eat, and eat again. Like usual, I didn’t want to miss a thing (*suddenly singing Uncles from Aerosmith song; I don’t wanna miss a thing, LOL). After so much self-thought-war, finally, at late night I booked a rent car for one day. Maybe it was cheaper to book a motorcycle than a car, but I thought it was rainy season and I don’t have driving license for a motorcycle. So, I went for car. (We can get IDR 50,000 for a motorcycle and IDR 180,000 for a car per day). So, after fully prepared I went to sleep beautifully. 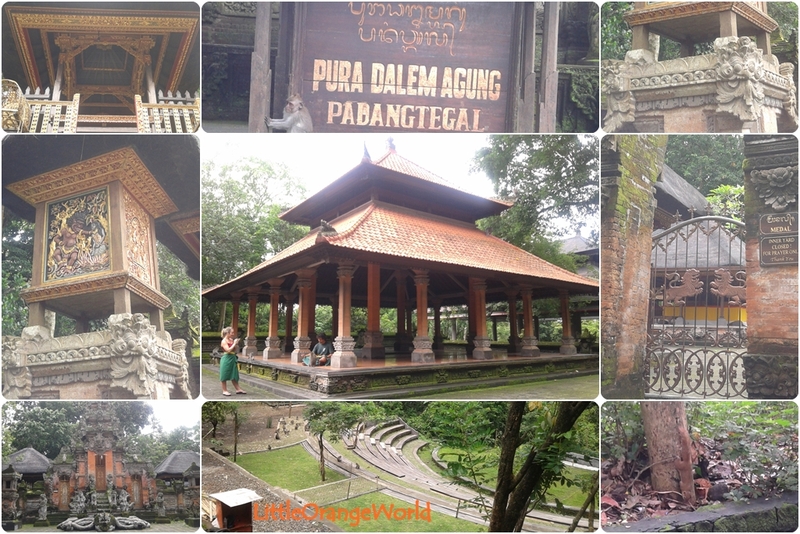 Ubud – Tegallalang – Kintamani. (oh yeah, finally I hired a driver too, due to energy saving). I had prepared at 10.00 am, now I think it was too late, I slept too beautifully. I guess. Hehehehhe. We drove to Ubud, kyak, I was really excited, imagined about the place that’s getting more infamous after Julia Robert spent times there for casting. I supposed to make a stop at Batubulan on my way to Ubud, to watch Barong and Keris Dance. But I was too late; the show already commenced about an hour. So I just skipped it (>_<”!). 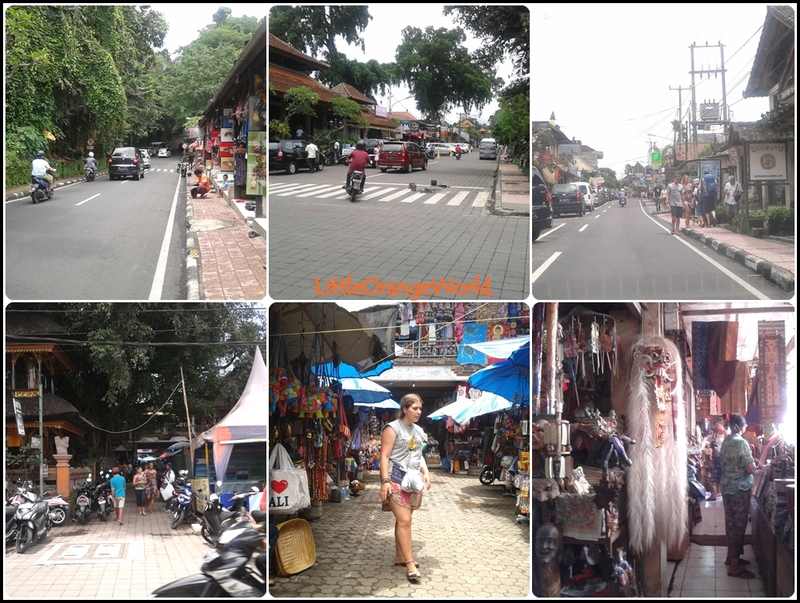 I think Ubud would be very interesting place for someone who loves art and loves calmness because that was what I felt while there. Just being there, the tranquility feeling hit me and my no-sense-of-art was attacked by so many (I thought) wonderful detailed sculptures and paintings. We can easily find museums, art galleries, and artist workshops, also some fancy restaurants. I supposedly didn’t make a stop at the gallery along the road because plainly didn’t have that-kind-sense of art. 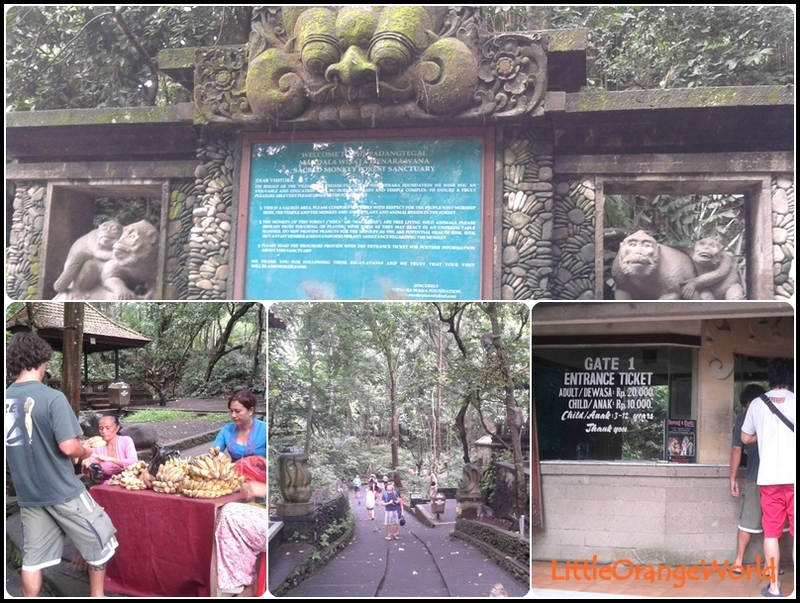 So I simply passed it, and then went to Sacred Monkey Forest (I think it describes me so well, LOL). Please Feel the Forest!! I like monkeys, cute monkeys, I love to collect monkey doll, so I was really cheerful here, even though at first I was afraid to make enclosure with those monkeys. But I overcame it. These are some of monkey emoticons, so varied and funny. It was hard for me to make enclosure at first because they live freely there. It is said that more than 600 monkeys live there…mm, I should greet them one by one :D.
We can call Bali as Island with thousands ‘pure’ since we could find it everywhere, in every corner, in almost each house. Even in this forest. Finished with those monkeys, I did something that I’d been longing for so long time. Babi Guling, literally Roasted-rolling-pork (sorry, to say it vulgarly, it is processed that way) at warung Bu Oka, this place is always full with customer,,,I was pulled to Bali by that too. It was so delicious. The portion was more than enough, the taste; it rich of spices, hot, and crispy, it was completed by delicious pork soup. 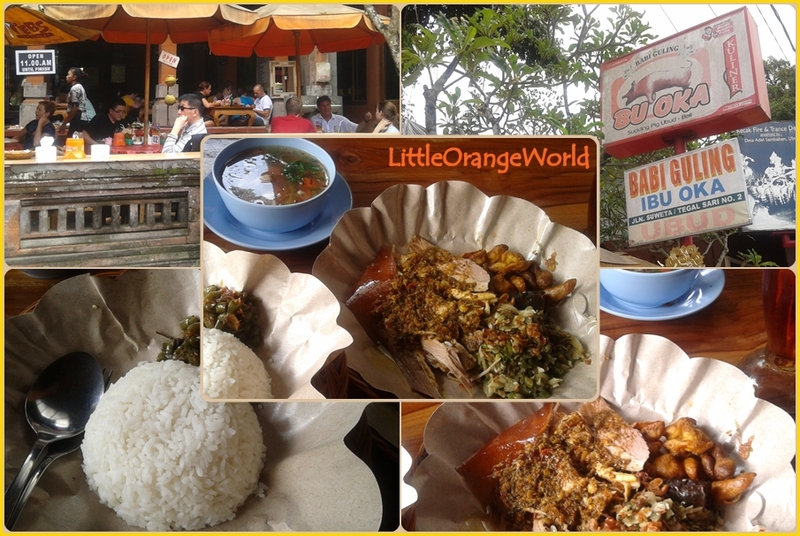 I’ll for sure back to Bali again someday for this gluttony pleasure. Kekekekeke. 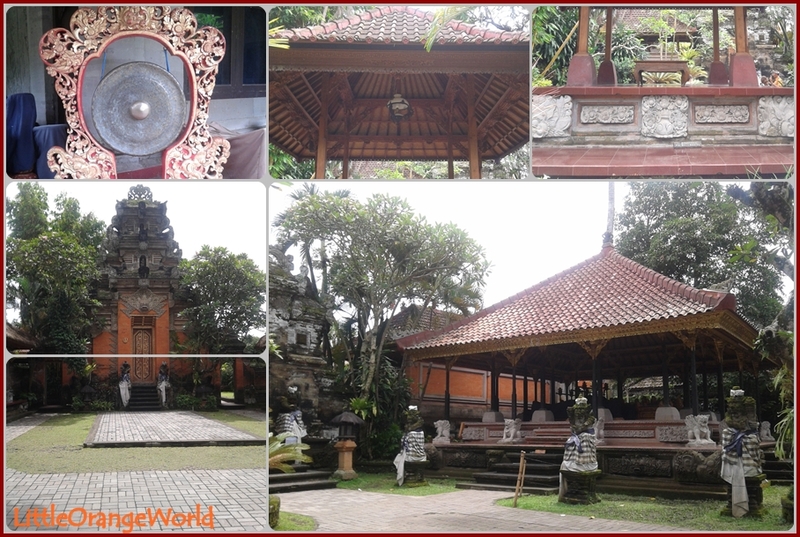 In front of Warung Bu Oka, there are Historical Palace of Ubud. These are a glanced view of it. Before completely left Ubud, i stopped at Ubud Market, unfortunately it was under construction, so there were only few shops opened that day. Racing with my limited time, hurriedly I was heading to Tegallalang, to higher area at northern part of Ubud, I couldn’t remember how long was our trip or how far it was (bad, bad, bad, geos). I enjoyed the trip in between. I could feel how strong Balinese with their costume. What I clearly remember is the air more refreshing, the weather getting colder, and the road getting narrower… If by any chance you want to go there, don’t close your window. Let it open, breath the fresh air, and smell the unique and typical favor of Bali, feel its hospitality, and absorb its creativity. 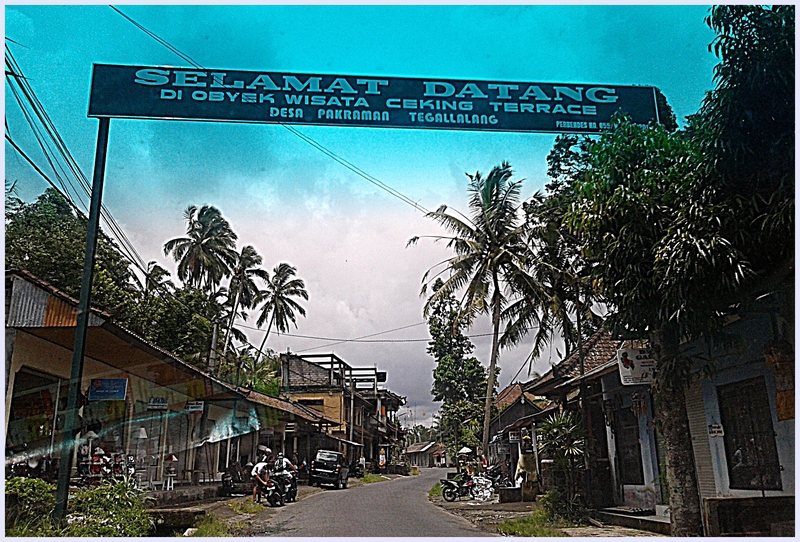 So, here I came to the Tegallalang, famous for its Ceking Rice Terrace. 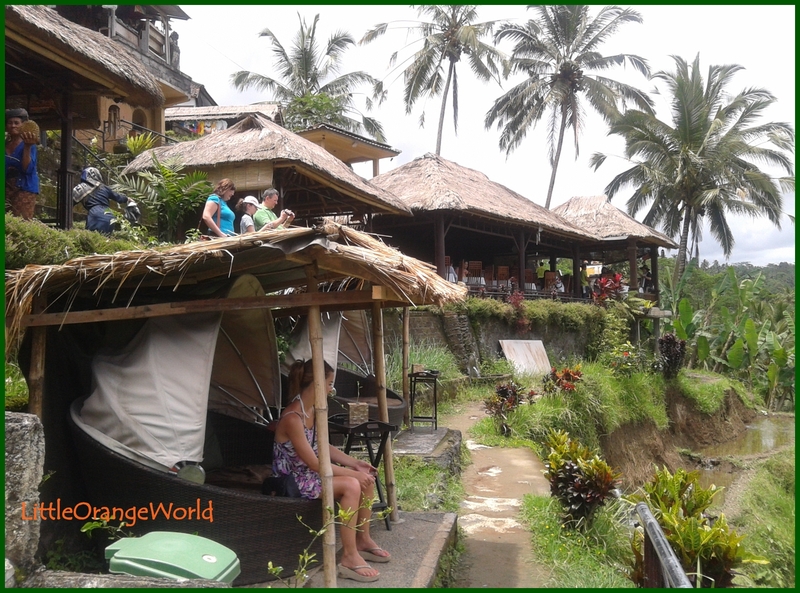 This is one of restaurant at Tegallalang with Rice field as view (please forget a little bit intrude by children who sell vary stuff here). This is how Ceking Rice Terrace looks like, splendid, isn’t it? This picture just shows little view of it. I could do more, but I think I picked the wrong time. It was too hot. I think it would be much better to visit this site at morning when the sun not zest gives its shine (LOL) or at evening when the sun almost gets tired and ready to head for the west. Then, I continued half day for first day to Kintamani highland until legian, Lowland. 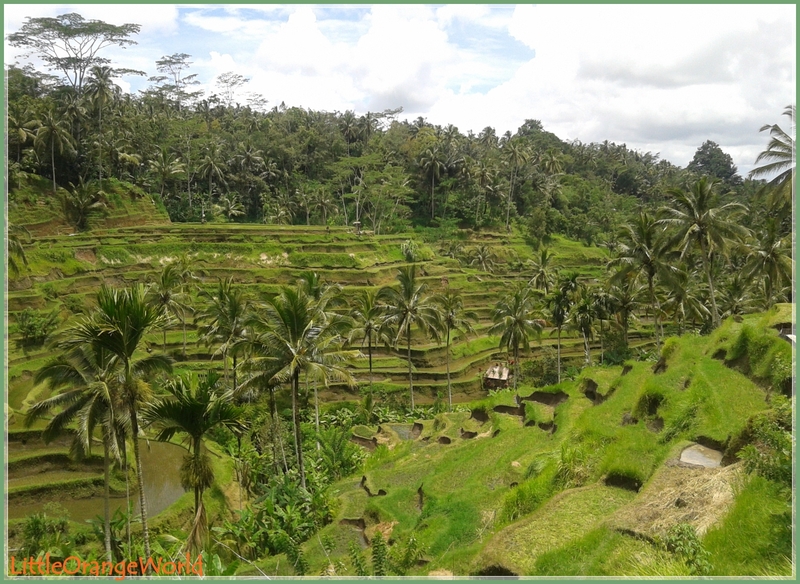 Wow….it is fun to read all your travelling posts…did you go to Bali alone? Awwww, thank you. yess, i traveled alone to Bali. there will be 2 more post about Bali since i spent 3 nights there i have much materials. wait patiently dear friend. I’ll show some of interesting point about Bali, of course from my point of view. i won’t make you wait that long. it came up already. kekekeke. Yep…just finished reading it! A very interesting post, my friend! I do hope you con come someday, and I’m happy to spare my time for you both :). i think it has a complete packet. Amazing mountain, beautiful beaches, and strong and unique custom and culture. Hehehe – I would love to come to Bali. A LOT of Australians go there, it is a favourite place. I will make it there one day, I hope. so, i hope that for you too. I look forward to your description when you write more about your trip. I would like to hear about the markets, I hope you plan to write about that, too. Yes, and the customs and the culture. It will all be interesting. I know nothing about Bali except that it is friendly and very beautiful. i see, of course, me too, i want to see Bali as Bali, but what i meant was there were to much tourist esp from Australia there. hehehehehe. oh yeah, the second already came up, just like usual, i give more glance snapshots :). Anything you tell about Bali or any of the places you visit is interesting. I like the snapshot idea, and that’s a great way to do it because it keeps it all light and easy. When you go to a place, you go to have fun, not to write a report on it. LOL. So don’t work hard to write lots – do as you usually do, that’s the best way. I like what you wrote about the monkeys. They would have made me very nervous. I know monkeys can be very aggressive. No, i didn’t work that hard and i think I’m not that type that would work that hard. kekekekekekke. i enjoy it and maybe the idea will give something new. i’m working on it, though :). yesss, they can, even though the guard say the already been tamed, it still made me afraid at first. what i didn’t tell is i was forth and back at the main gate for so many times before exactly entering the whole area. LOL. yeee..keBali kok ndak bilang2 mbak.. itu lokasi sekitar 5 km dari rumahku, pasti ngelewatin deh mbaknya..heehee.. 🙂 Have fun di Bali yaahh..